You don't need to be an alien invader or starship captain to design your own spaceship - you can create an exciting environment in seconds with Stareship Tiles! 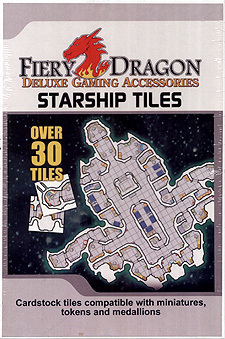 With more than 30 full-colour cardstock tiles (each tile is 5" x 5"), you can create dozens of different ship designs for your tabletop roleplaying or miniatures game. There are 10 starship medallions in this box - durable plastic dry-erase counters that can be used for spacefights of your own creation. 4 pages of floorplans are included to get you started. BONUS! includes two space-themed 1" battlegrids!